Over the weekend, my son and I were trying to use the Video Physics app to take data of marbles flying off the kitchen table, but they were moving too fast for the iPad camera in the low light so we headed outside and got some amazing data. 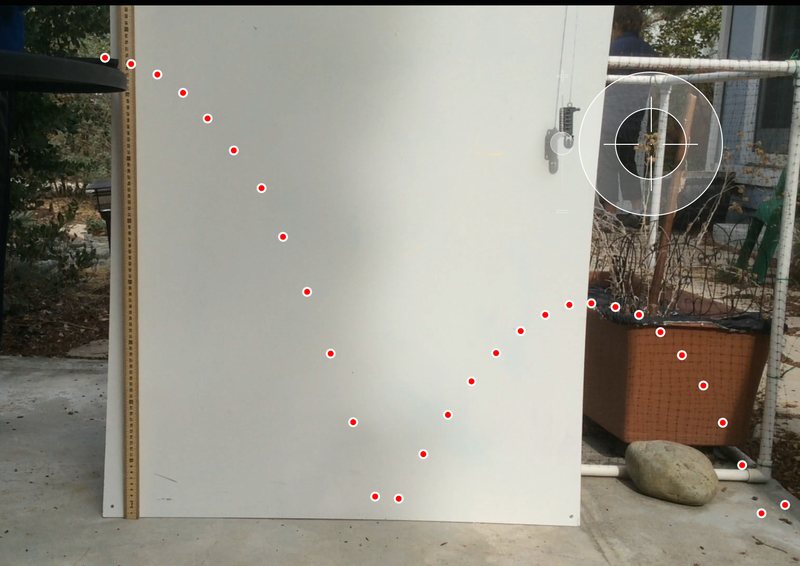 So for class today (and possibly all future experiments using Video Physics) , the students took their data outside.The red dots in the image mark the location of the ball in each frame of the video. Most kids just took data for the initial drop but this one got a nice bounce and as you’l see below, the data for the bounce turned out better than the initial drop. When working with projectiles we can break the physics into two problems, motion along the horizontal X-axis and motion along the vertical, Y-axis. 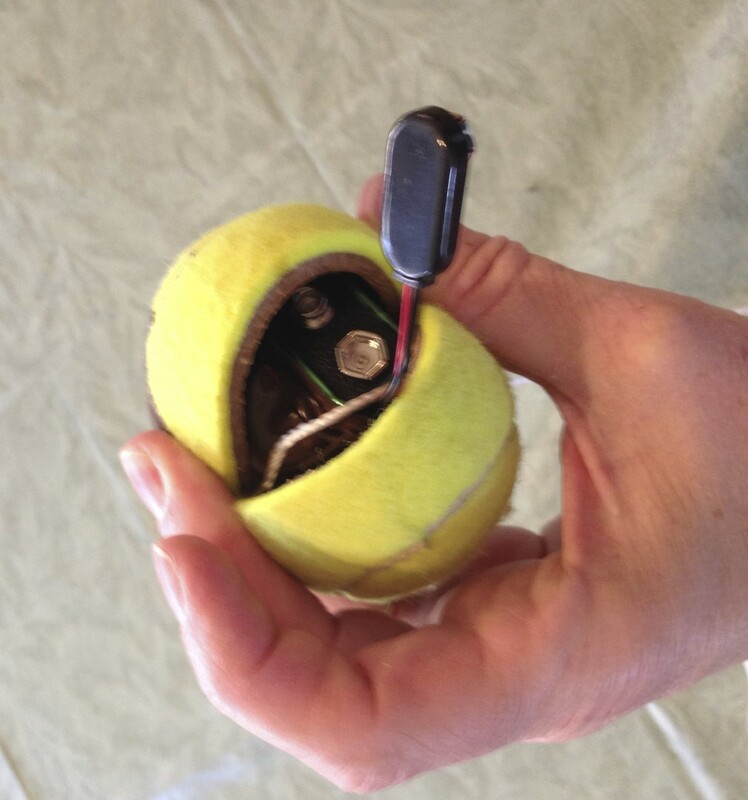 The only force on the ball after it leaves the track is the force of gravity which equals the mass of the ball times the acceleration due to gravity (-9.8 m/s2), F = mg, which only pulls on the ball along the Y-axis. S o the velocity of the ball in the horizontal direction (X) should be constant, which it was. Graphs of X position as a function of time, were very linear, and the slopes of those graphs gave the horizontal velocity of the ball, which also happened to be the initial velocity of the ball. In the example on the left the horizontal velocity was 160 cm/s or 1.6 m/s. The linear fits were done with the Graphical Analysis app. 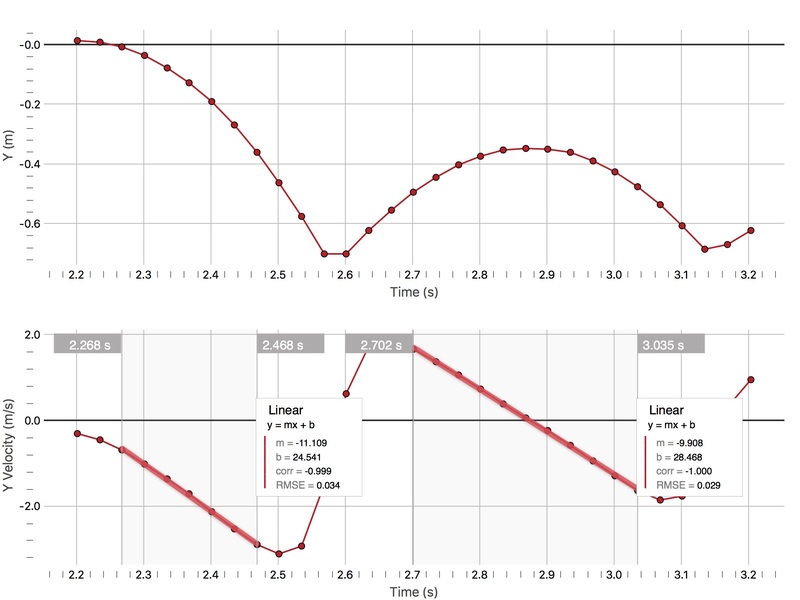 In the top graph below is the Y position or height of the ball for the data taken in the first photograph, measured in meters (m) as a function of time and the second graph is the velocity of the ball along the Y-axis (vertical). You can see that vertical, Y, position of the ball is NOT linear with respect to time, but its velocity while in the air (bottom graph) can be fit very nicely by a line, especially after the first bounce. The slope of a velocity vs time graph gives you the acceleration of the ball, which in this case came out to be -9.9 m/s2, very close to the expected value of -9.8 m/s2. The students took data for 3 different marble drops, just dropping the ball, with no horizontal velocity, and using the marble runs to give it two different initial velocities. They determined that the time it took the ball to fall for all three was about the same and the range (total horizontal distance traveled) increased, as expected, as the initial velocity (along horizontal axis) was increased. 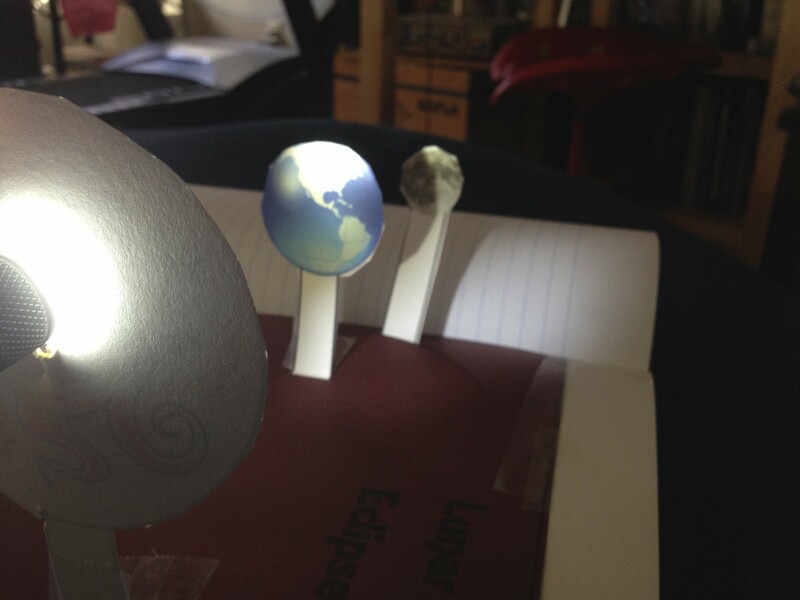 Since we’l be able to see a lunar eclipse on Sunday, I had the students make a lunar eclipse model for their notebooks that I got from Earth’s Place in the Universe. You shine a flashlight through the hole in the ‘sun’, the earth casts a shadow and you can move the moon around in its ‘orbit’ and watch it pass into the earth’s shadow. Its not even close to being to scale, which would be very hard to do since the moon would have to be 30 earth diameters away… wouldn’t fit in a notebook! There’s another model for solar eclipses in the same organizer that’l we’l put together another day. 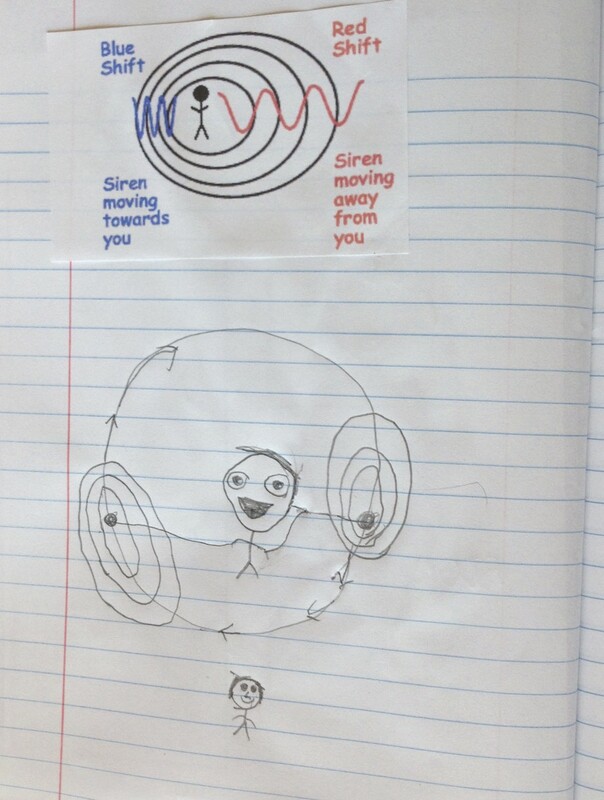 We also watched a video on youtube by Physics Girl. The other activity we did was a constellation box. This is one of my favorite astronomy activities because it really gets the point across that stars in the same constellation are not necessarily near to each other. When its finished and you put your eye at the end of the box, you see the pin heads in the position of the stars, just like we see them in the sky. But when you lift your head up you can see the stars are spread out over a thousand light years. We had done this a few years ago with the Big Dipper constellation. I got the original activity from TOPS Learning Systems: The Planet and Stars, published in 1994. 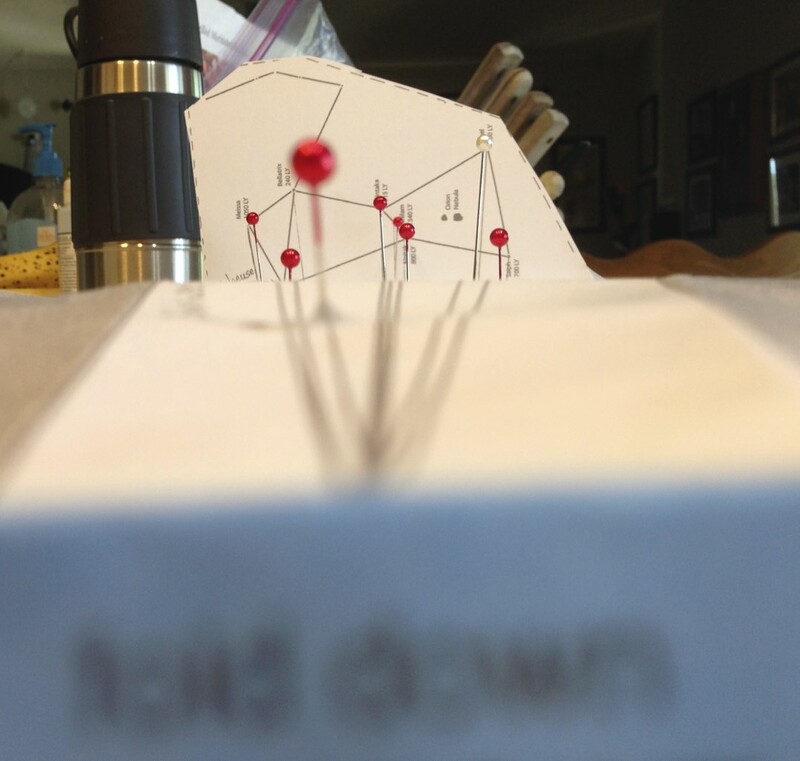 While preparing for this class, I found another activity that used thread and pony beads to make a 3D constellation that sounded cool, but as you can see in the photo below, difficult to realize (pinterest fail). The thread was impossible to deal with and the beads kept sliding down. The activity did say to use button thread which might have worked better, but I lost my patience after 30 minutes and dug up the old dipper box activity. Pins don’t get tangled. But one thing I noticed in the thread activity was that it said the Big Dipper constellation wasn’t very good to use for this because all the stars ARE close to one another. Apparently we have gotten better at determining the distances to stars since 1994, because the latest data for the Big Dipper stars was different than the activity in the TOPS book. Since quite a few kids in my current class had done the dipper box, I decided to convert that activity to the Orion constellation. It came out pretty well, though we had to get some 2 inch pins (the one with the silver head) because one star was just a bit too high for regular sewing pins. We had some time left over at the end of class so I showed a few more videos. Over the weekend I glued some sandpaper to some wooden blocks I happened to have in the garage and screwed some eye hooks into them to make friction blocks for today’s lab. The students were to find the coefficient of static friction for two different block/surface combinations; sandpaper block on a bare wood surface and wood block dragged on a wood surface. As you can see in the photo they used spring scales to measure the maximum force they could exert on the block before it started to move. In the diagram below you can see the block sitting on a table and the 4 forces acting on the block. The force of gravity, or weight of the block and the normal force must cancel each other out since the block is not moving in the vertical direction. The normal force is just the force exerted by the table on the block. If the block is not moving, then the two forces along the horizontal, the force we’re pulling on the block and the force of friction which is resisting that pull, must cancel as well. Eventually we will pull hard enough that the block starts to move. The students measured the maximum force which they could exert on the block before it moved. They also measured the mass of the block with a triple beam balance so they could calculate the force of gravity and hence the normal force. Once they had the normal force and the maximum pulling force they solved for the coefficient of static friction, μs. Have you ever had to move a very heavy object? When you push on it a little it doesn’t move, but when you push really hard and finally get it moving you find you don’t need to push as much to keep it moving. When an object is moving the frictional force is smaller because the coefficient of kinetic is smaller than the coefficient of static friction. The students did the experiment again but this time they pulled on the block to keep it moving at constant velocity. If the velocity is constant, then the net or total force on the block is still zero and they could use the same formulas as before to find the coefficient of kinetic friction. Reading spring scales while pulling on blocks isn’t the easiest thing to do so the students also used a pulley system to exert the force on the block. This was a more accurate method, but it took a bit longer. The results compared pretty well with the spring scale measurements. Today we started by asking, “How far away are the stars? Are they all on a sphere? Are they different distances away? 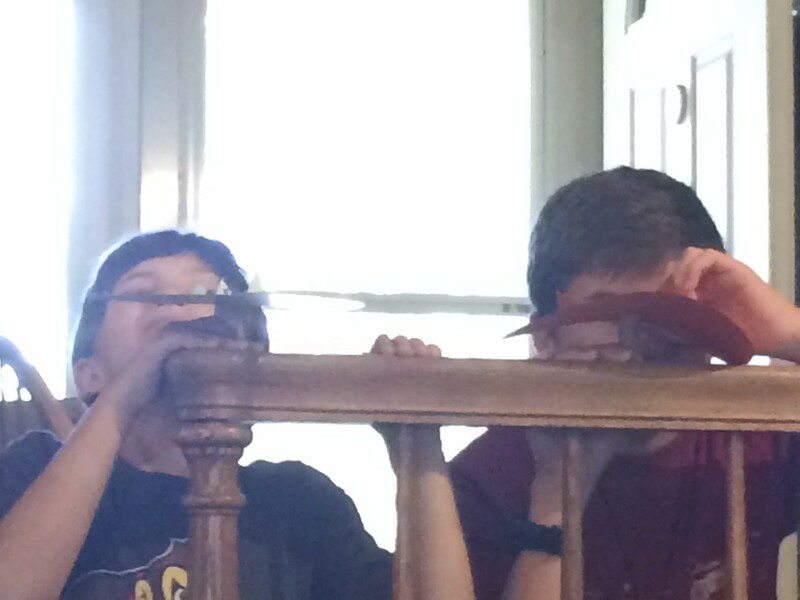 How do we measure how far away they are?” I asked them to hold up a thumb, close one eye and hold their thumb so that it covered up one of the parents heads, who was standing in the far end of the room, … then switch eyes! 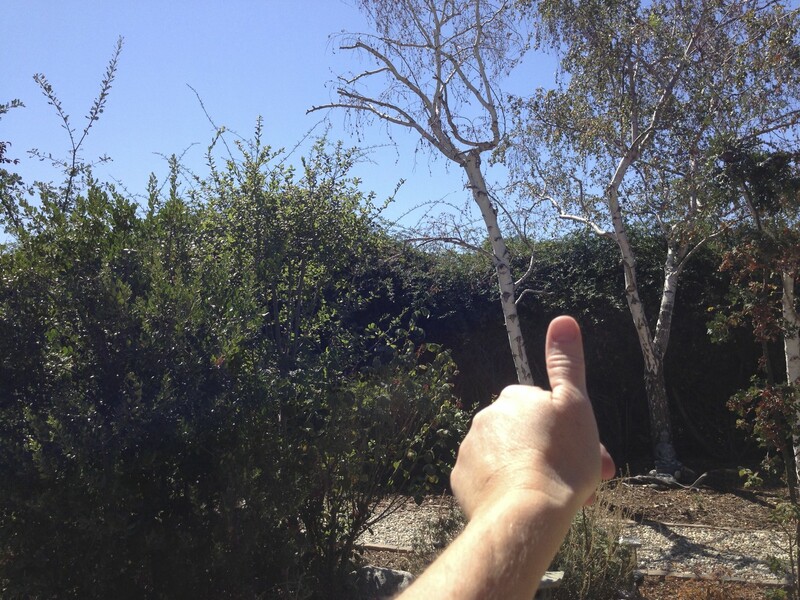 The thumb is no longer covering the parent’s head – this is parallax. In the pictures below I held my iPhone camera by my left eye and then the right, I did NOT move my thumb. 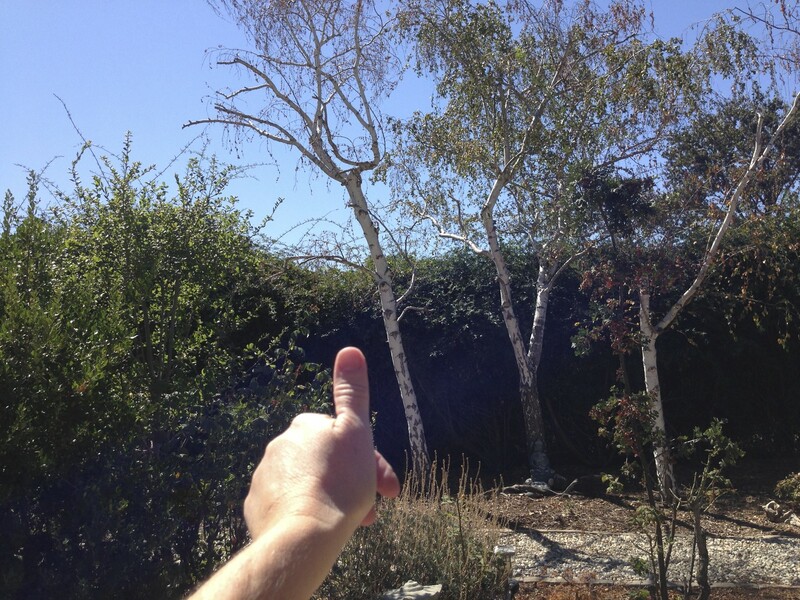 Each eye is in a slightly different location and my thumb appears to move with respect to the trees in the background. Stars do the same thing and we call it stellar parallax. The Earth is moving around the sun, giving us different views of the night sky from different positions (like our right and left eye). Stars that are closer to us will appear to shift, like our thumb, with respect to stars that are further away (like the trees in the photos). New Mexico State University’s Astronomy page has this nice diagram for stellar parallax. In the top diagram, the blue star, which is closer to us, appears to the left of the more distant ‘pink’ stars when we’re viewing from Earth in the ‘now’ position. But, 6 months later when our position has moved to the other side of the sun, the blue star now appears to be to the right of the ‘pink’ stars. You can see how this effect depends on the distance of the blue star from the more distant reference stars by looking at the bottom diagram. The blue star is further from us, and the effect – its apparent change in position is not as dramatic as the first diagram. 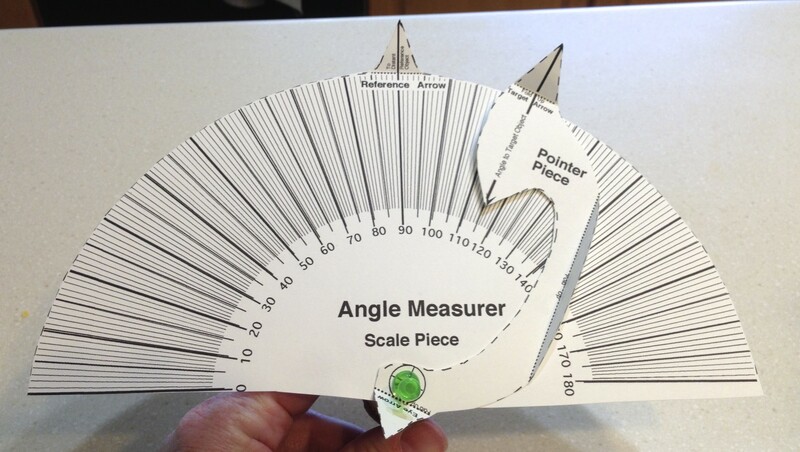 To really understand this the kids made an angle measuring device and found the distance to a paper star that I put in my living room by measuring the parallax angle with respect to a more distant paper star. 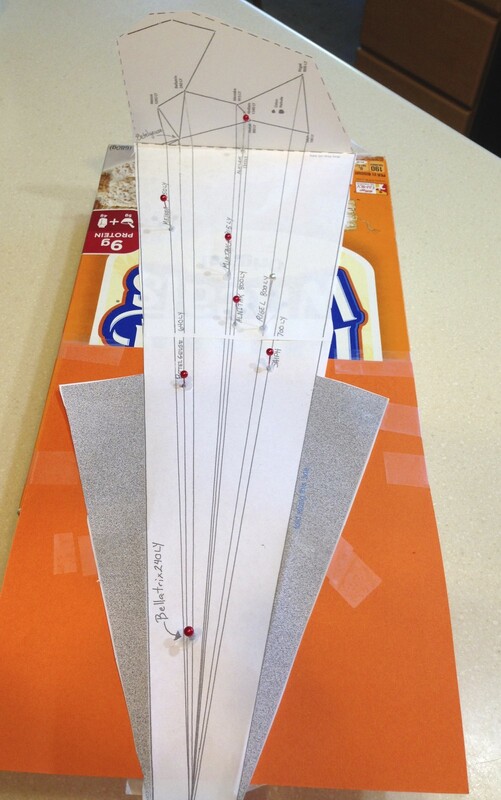 I used the “Measuring Parallax” activity from the Universe at Your Fingertips dvd that I’v mentioned before. All I had to do was print out the pages for the measuring device (basically a protractor with pointers for lining up the stars) on card stock and let the kids cut them out and put them together. They measured the angles between the reference star and the star of interest from two different locations and using the sheet included in the activity, could figure out the distance to the star of interest. Most got a fairly reasonable answer. This activity was nice for younger kids because it has a table to look up their parallax angle, so they didn’t have to do any geometry or math besides some subtraction and multiple by 1/2 (the distance between where they took their measurements was 1/2 meter). I also showed this video of making a scale model of the solar system since we have done this in class a couple of times. When everyone finished taping everything into their books we had cupcakes to celebrate the birthday of one of my students… any excuse for cupcakes! Next week we start Unit 3: Stars. Today we investigated how mass and force affect acceleration. We used the air track, attaching a string from the glider, across a pulley on the end of the track, to a small basket hanging off the end of the table. The weight of the basket will be the constant force pulling on the glider and causing a constant acceleration. The recording of data and analysis was very similar to last week – we used Video Physics and Graphical Analysis apps, but they had to run through the process many times. 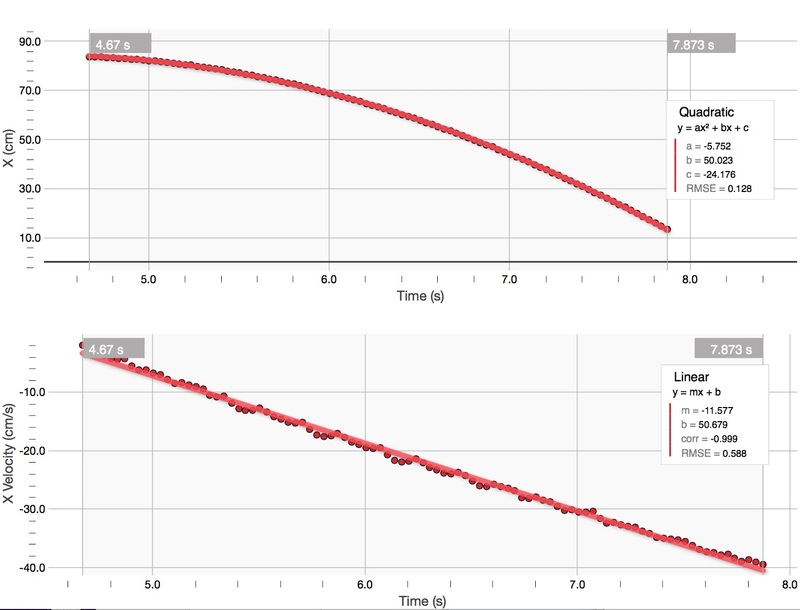 The students took data for three different forces pulling on the cart and found the acceleration each time by finding the slope of the linear velocity vs time graph (see photo above). They also took data for three different cart masses – you can add weights to the cart to increase its mass. The acceleration of the cart changed as expected, when pulling with a great force, the acceleration increased. 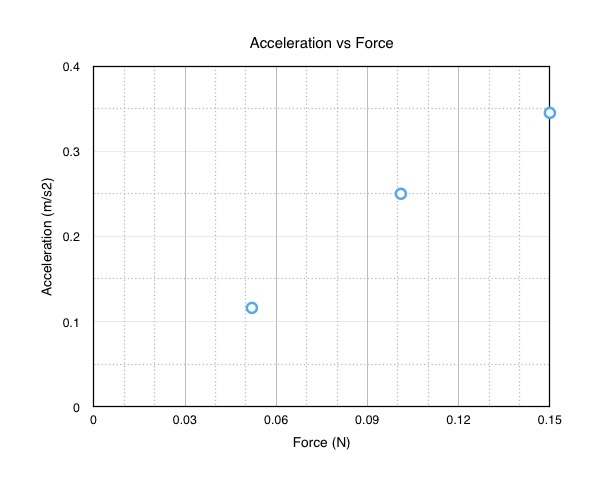 If the mass of the cart was greater but the force was the same, then the acceleration decreased. So we can conclude that our data supports Newton’s 2nd Law, F = ma. We had to be very careful with units in this lab. The students have to set an origin and scale in the Video Physics app and if they did it in centimeters (cm), they had to either write their acceleration is cm/s2 or convert to m/s2. We were adding masses labeled in grams to the bucket to change the force, but had to convert those to kg so we could calculate the force in Newtons (kg m/s2). 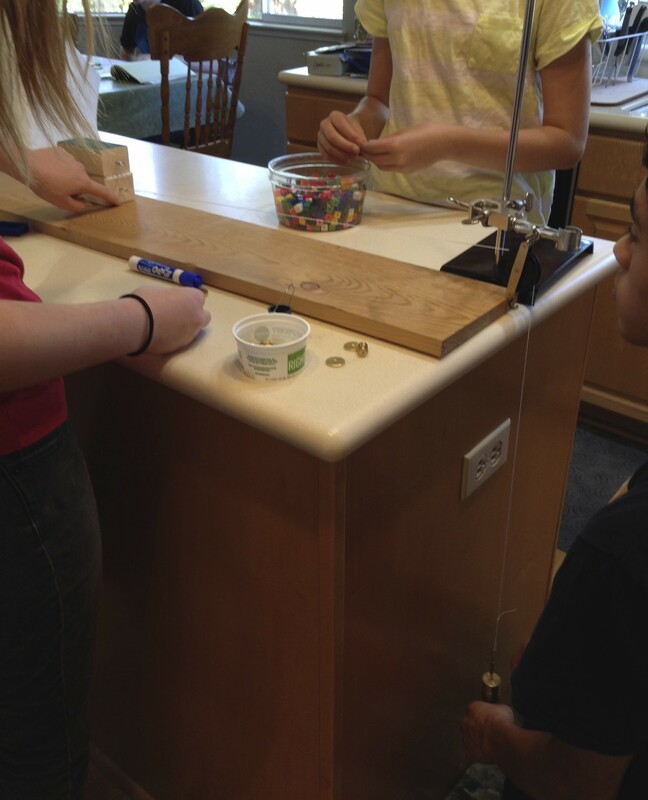 This experiment can also be done with a simple cart with wheels and a pulley attached to the edge of a table. I encouraged the students to sketch the apparatus in their lab books, unfortunately I forgot to take a picture.